Mwah ha ha ha ha. Fear for your lives, pretty ones, because the maniacally monstrous Boulet Brothers are back again, serving up wickedly inventive drag battle realness with the second season of their devilishly addictive Dragula, streaming now on SBS On Demand. The subversive LA drag queens have leapt to SBS On Demand with an opening scene featuring the slaughter of boardroom executives trying to knock back the show's concept due to the “frankly disturbing and disgusting message" of the show, suggesting they try being, “a little less bloody and a little more heterosexual.” Good luck with that. Pitting 10 contestants against one another for a $10,000 prize and the crowning title of 'Dragula, the world’s next super-monster', they must master horror-movie costuming, make up, and performance, all while trying to avoid intense extermination challenges including extreme piercing and deliberately bad tattooing. 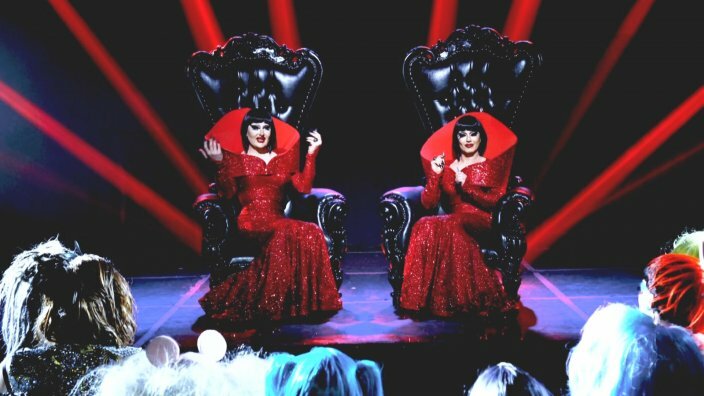 In honour of their dastardly reanimation, SBS Sexuality put some blood-curling questions to the Boulets. As ever, the meticulously-staged death scenes of the losing contestant are bloody magnificent, with episode two’s Texas Chainsaw Massacre riff a gloriously gory highlight. What goes into staging them? “Some people don’t have the stomach to fully appreciate an execution by chainsaw, so we think it’s delightful that you enjoyed one of our girls being chopped to bits like that. You clearly get off on the horror aesthetic, but what are some of the most iconic scary movie moments that have left their mark on you? “The scene from The Exorcist where Regan is hovering over her bed in the throes of demonic possession still haunts us at bedtime to this day. We were so jealous of her. Clive Barker’s Hellraiser brought us to strange places in the human psyche the first time the Cenobites appeared from the inter-dimensional rift; puzzle boxes, flesh hooks, leather, and a sadistic five-way definitely leaves an impression. Shifting the focus away from aesthetics toward challenging the perceptions of LGBT+ men today, the new series may surprise you with some laughs and even a few tears. How did you will Dragula into existence? The party got so big it busted out of LA and terrorised San Fran, New York, and Austin, but did you ever imagine TV stardom awaited? “We knew trying to explain to a network the concept of a punk drag competition show based in horror and glam would be next to impossible, so we created the first season of Dragula as a pilot. We launched it and the show caught the imagination of weirdos all over the world. Again, many people told us it would be impossible to do, so naturally, it’s exactly what we did and it paid off. Performer Trevor Ashley believes it's time to stop and celebrate both the achievement of marriage equality and the 40th anniversary of the Sydney Gay & Lesbian Mardi Gras. While season two gets off to a ferocious start with the contestants tearing each other down, there seems to be a support network for freaks and geeks at the beating heart of the show? How do you manage to raise the stakes with your own looks as the series goes on and the competitors get wilder? “Most of the time we actually have to tone our looks down a bit, you know, so as to not make all of the contestants feel so inferior that they give up. I know what you’re thinking, you didn’t expect us to be so nice and considerate did you? We get that all the time."